Automated ﬂathoning has distinct advantages over conventional lapping processes that use an abrasive slurry. The process is fast and accurate as well as automated. Traditionally, the grinding process known as lapping has been employed in stock removal of metal and ceramic workpieces to achieve a desired concentrically or “ﬂatness.” Flat lapping typically involves a slurry of loose aluminum oxide, silicon carbide or other abrasive grains ﬂowed across a rotating lap plate in either a water-based, synthetic or oil-based vehicle. This creates an abrasive ﬁlm between the plates and the workpiece that enables stock removal from a single side or from both sides simultaneously, of regular or irregular shapes, without distortion from clamping or heat. The loose abrasives leave a dirty residue that must be rinsed clean after lapping. Controlling this loose abrasive process in most cases has to rely on the experience of machine operators. ﬁnished product with today’s abrasive technology and CNC machinery. By using bonded CBN or diamond particle in a ﬁxed medium that replaces the loose abrasive process, ﬂathoning achieves the same or greater precision with ﬁxed abrasives than those accomplished through conventional ﬂat lapping. Consider a tungsten carbide insert application. Inserts might ﬁrst be ground on a traditional lapping machine with special ﬁxtures holding up to, for example, 200 units. After grinding one side, the inserts are un-ﬁxtured, turned over, re-ﬁxtuxed and ground on the other side. Throughput averages between 200 and 300 parts an hour. Removing the typical 0.020 to 0.025 inches of stock from a tungsten carbide insert with a ﬂat-lapping machine usually requires 2 to 3 hours because the material is so hard. Multiple workpieces are processed at a time using discs to hold and orient the parts. But ﬂathoning machines are unlike conventional ﬁxed abrasive grinders used for sizing components. Clean lapping far exceeds the 0.0002- to 0.0003-inch tolerances of conventional grinders, and it takes that 0.025 inch of carbide stock off both sides simultaneously within 4 to 5 minutes. 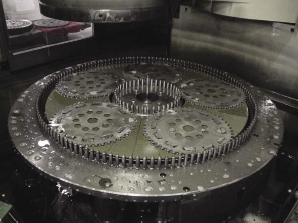 On a smaller machine, 100 to 150 inserts can be ﬁnished within 7 to 8 minutes, a rate of 700 to 1,000 parts per hour. 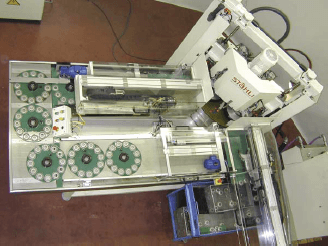 Speed is a primary reason double-sided ﬂathoning is replacing conventional grinding and ﬂat lapping in numerous applications across many industries. One ﬂathoning machine can often replace three to four grinders and their associated labor and over-head, or reducing it can decrease high tolerance lapping cycles to a few minutes. Stock removal rates are multiples of 10 to 20 faster than lapping, and certain tolerances being achieved now exceed those being lapped. Flathoning can hold thickness variations within 0.6 micrometers (0.000024 inch) in a single batch, with overall batch-to-batch tolerances of ±1 micrometers (0.000040 inch) on a 24-hour basis. That capability comes from using a ﬁxed, bonded material (as opposed to a loose material),with the added ability of removing stock faster. Parts exceed the 0.0002-inch tolerance threshold. Retooling a variety of jobs is necessary. Flathoning, with the proper wheels on the machine, takes less than 5 minutes to retool, compared to several hours for traditional grinding machines. Components have uneven surface areas between the top and bottom. Lapping tolerances are required, but higher throughput is necessary. Working nonferrous or nonmagnetic materials. With lower abrasive costs, increased throughput, superior accuracy’s and reduced labor, the technology in ﬂathoning can be the solution for many traditional grinding applications.